If you're crazy enough to jump out of airplanes for kicks, here's a way to double the thrill. A German entrepreneur has created the Skyray, a pair of carbon-fiber wings that give skydivers a bit of extra lift and control. Instead of falling straight down, divers cut through the air at speeds of up to 136 m.p.h. and can stay aloft for an extra minute or so. How does it work? 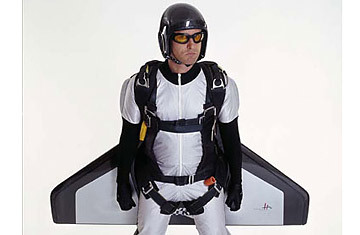 The combination of the wings' shape and the skydiver's position modifies the airstream to create the lift needed to float forward. When it's time to land, a diver just pulls the parachute's ripcord as usual.